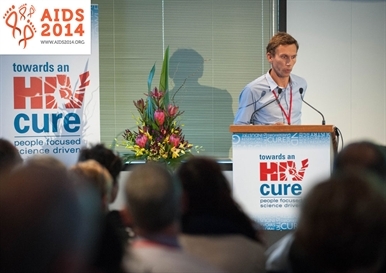 Ole Schmeltz Søgaard, of Aarhus University Hospital in Denmark, presenting at AIDS 2014. Photo: International AIDS Society/Steve Forrest. The HDAC inhibitor romidepsin was able to awaken latent HIV in resting T-cells, causing it to start producing new virus, but this was not associated with a decrease in the size of the viral reservoir on T-cells, researchers reported on Tuesday at the 20th International AIDS Conference (AIDS 2014) in Melbourne. This finding suggests that kicking HIV out of hiding will not be adequate for a functional cure without strengthening immune responses against the virus. One approach widely used in HIV cure research is known as 'kick and kill'. This strategy involves using various agents to reactivate latent proviral DNA in resting cells. Once the cells are 'woken up', this hidden viral genetic blueprint starts churning out new virus. This makes the virus-producing cell visible to the immune system and the escaping virus is susceptible to antiretroviral therapy (ART). One type of agent used to kick-start resting cells are histone deacetylase or HDAC inhibitors. HDACs are enzymes that keep DNA tightly coiled in a cell's nucleus, so it cannot be used to direct production of new proteins. HDAC inhibitors reverse this process, allowing proviral DNA gene expression and production of new virus. Ole Schmeltz Søgaard from Aarhus University Hospital in Denmark and his team evaluated the HDAC inhibitor romidepsin, an anti-cancer drug used to treat lymphoma. Previous laboratory studies showed that romidepsin is a potent activator of resting T-cells in vitro. Søgaard's team tested the safety and efficacy of the approach in people living with HIV. The study included six adults living with HIV (five men and one woman) with a median age of 54 years. They had been on combination ART for a median of 9.5 years, but none had started during acute or primary infection. They had undetectable viral load (HIV RNA <50 copies/ml) for at least one year and a median CD4 count of 760 cells/mm3. People with significant cardiac disease or hepatitis B or C co-infection were excluded. All participants in this non-randomised intervention trial received three once-weekly infusions of romidepsin (5 mg/m2) at days 0, 7 and 14. The researchers found that romidepsin increased histone H3 acetylation in lymphocytes, with the magnitude of the effect increasing after each successive dose. The effect diminished slowly and some activity was still apparent through the end of follow-up at 21 days. Levels of cell-associated HIV RNA in CD4 cells rose significantly in all study participants after romidepsin administration, with larger increases seen after the second and third doses compared with the first dose (more than a threefold mean increase). Plasma HIV RNA also increased, despite participants being on ART, reaching quantifiable levels in five of the six participants using a standard clinical viral load assay. The researchers saw the greatest activation in the central memory and 'term diff' subsets of T-cells. Romidepsin rapidly altered CD4 and CD8 cell composition, with a shift towards more naive cells and fewer effector and central memory cells. Expression of PD1 – a marker of cell exhaustion – decreased in both CD4 and CD8 cells. Together, these findings indicate that romidepsin acts as a reactivating agent that 'kicks' latently infected cells out of latency, the researchers concluded. Yet despite evidence of increased T-cell activation and renewed HIV replication, the size of the viral reservoir, as indicated by total HIV DNA in CD4 cells, did not change. Some participants experienced a small increase and others saw a decrease – including one with a reduction of 80% – but the overall change was not significant. Romidepsin was generally safe and well-tolerated. Participants reported 36 adverse events considered related to the study drug, most of which were mild and resolved spontaneously. The most common side-effects were nausea (12 events), other gastrointestinal symptoms (8 events) and fatigue (5 events). "Romidepsin safely activated latently infected cells and induced transient quantifiable plasma viremia," and "phenotypic changes occurred in the T-cell compartment during romidepsin treatment," the researchers summarised. However, "the HIV-1 reservoir was not significantly reduced by romidepsin." "We have enough data to say the agent was successful in doing what it was supposed to: kicking virus out of cells," Søgaard said at an International AIDS Society "Towards an HIV Cure" press briefing on Monday. "We can make cells release virus into plasma, but that may not be enough to reduce the reservoir." These data offer "the first evidence that we can identify the latent reservoir and shock it out of hiding in people," Steven Deeks of the University of California said at the briefing. "That is the single most important advance of this meeting and it will have a major impact in the future. That's the shock. But once [the virus] gets out, we have to kill it." Deeks, like most others working on HIV cure research, thinks a combination approach will be necessary to achieve a functional cure that allows people living with HIV to remain off ART without disease progression. As virus is released from resting cells, the immune system will need to recognise and attack it. Søgaard said his team has just started enrolling participants in a new study looking at romidepsin in combination with a therapeutic HIV vaccine (Vacc-4x). Søgaard OS et al. The HDAC inhibitor romidepsin is safe and effectively reverses HIV-1 latency in vivo as measured by standard clinical assays. 20th International AIDS Conference, abstract TUAA0106LB, Melbourne, 2014.